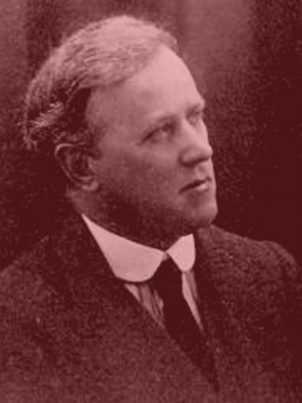 David Vaughan Thomas is one of the most important composers in the transitional period of Welsh music from the Victorian era to our own times. He was a highly talented individual in several fields, most notably in mathematics which was his first degree at Oxford, and it was while studying there that his pianistic talents came to the fore. After periods teaching in the United Services College and Harrow School he eventually settled back in Swansea where he enjoyed a freelance existence. He took the Oxford BMus in 1906 and the DMus a little later in 1911. 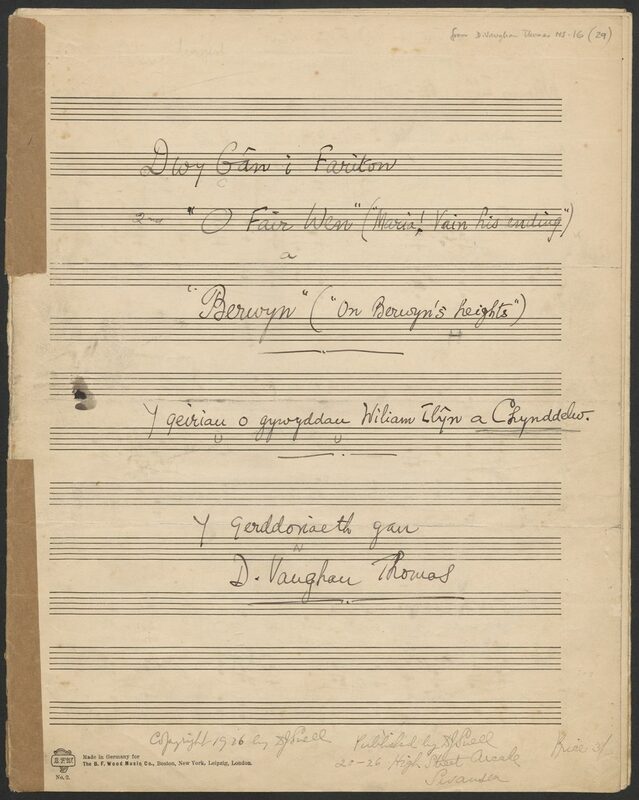 The 1912 premiere of The Bard in London was heralded as the ‘first chapter of England’s recognition of Welsh music’ and it followed the composition of other large scale works such as Llyn y Fan and the Song for St. Cecilia’s Day. These works display the outward-looking Europeanism of a composer rapidly finding his feet at an exciting time in music history. His failure to obtain the Chair and Directorship of music in the University of Wales was a cause célèbre in Welsh music for a considerable time. Sir Walford Davies, as he later became, was appointed and approved by the Gregynog-Downing Street axis that pushed for the post to go to Davies. Thomas became a home and overseas examiner and it was on a journey in South Africa that he died in September 1934. Thomas’s musical output embraced several genres and his development could be described as something of a ‘move forwards to the past’. 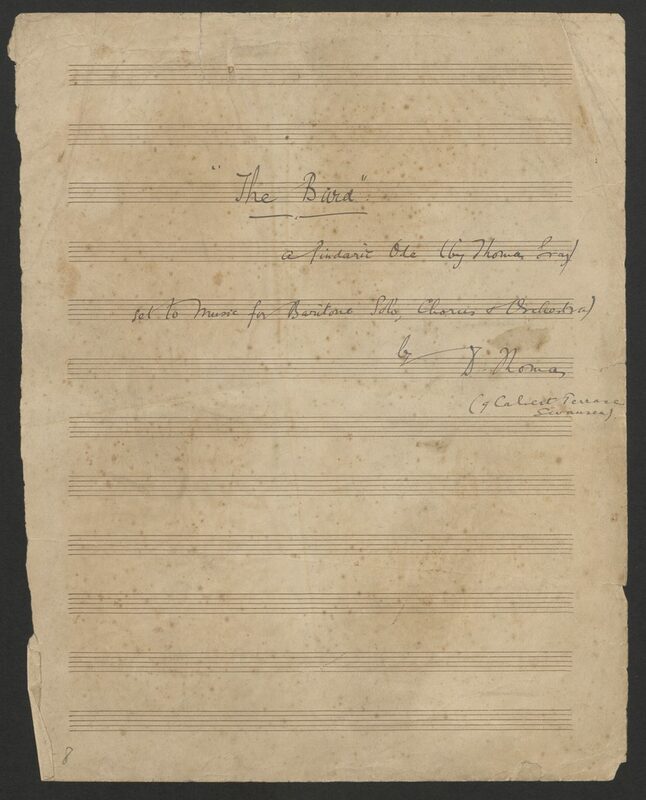 From the Victorianisms of the early songs, his music was coloured by several features from the Welsh past as seen in his settings of cynghanedd in Saith o Ganeuon gan Dafydd ap Gwilym ac eraill – seven songs that set early complex metre to good effect and composed in 1922. David Vaughan Thomas's manuscripts are held at the National Library of Wales. Please visit the database of their collection here. Mae llawysgrifau David Vaughan Thomas o fewn casgliad Llyfrgell Genedlaethol Cymru. Ewch i chwilio'u bas data yma. The Bard is a large scale work for chorus, baritone and orchestra and it employs a musical language far in advance of anything composed by a Welsh composer before this. Its structure is taut and the musical rhetoric close to the poetry with rhythmic inflections reflecting the text in often pungent harmonies. Other works reflect his sophisticated approach and taste in poetry. The medieval poets are set in O Fair Wen and Berwyn (1926) whilst Yr Hafaidd Nos (1914) and Caledfwlch (a proof of this piece can be seen in the next section) reflect his awareness o more contemporary poetry by Afalon and T. Gwynn Jones. 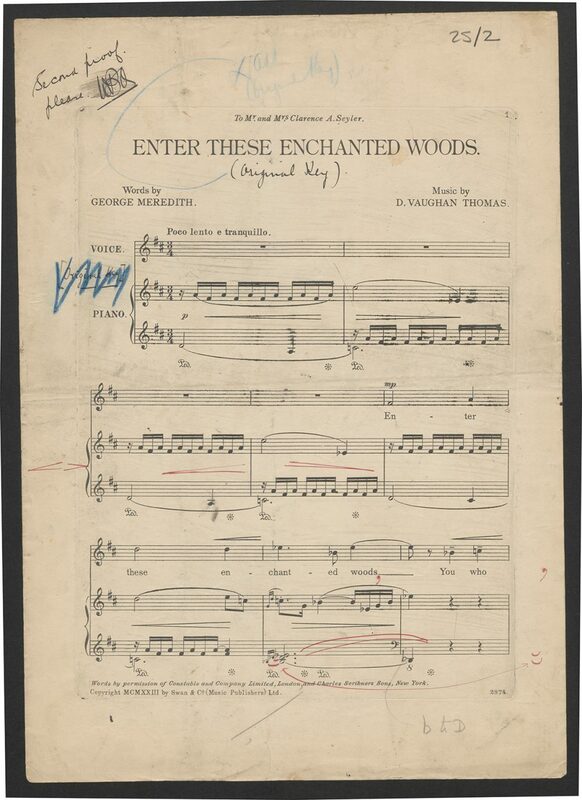 Enter these Enchanted Woods sets poetry by Meredith and the harmonic language is pungent and piquant in turn reflecting the poetic sensibility effectively. Caledfwlch (as noted above) reflects his awareness of the contemporary poetry of T. Gwynn Jones. 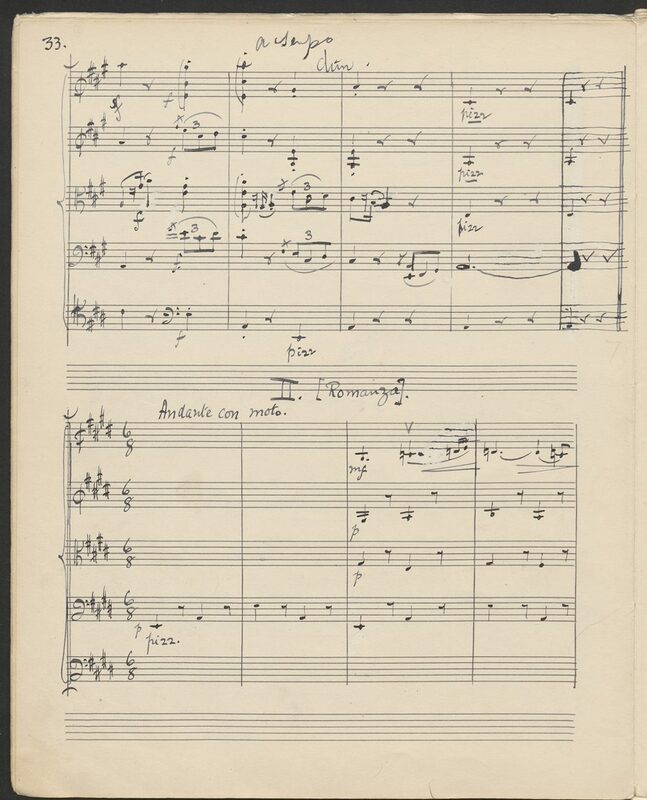 The String Quintet is easily one of the most accomplished works of it’s kind by a Welsh composer before 1930. Here, the lyrical tonal intent is tempered by sophisticated, often subtle, harmonic change and it manifests a real feeling for the medium.